Lorraine Pascale has a new BBC TV series “Home Cooking Made Easy” and she makes some of my favourite dishes including Beef Wellington, Scotch Eggs and a Hearty Paella with Sherry, Chorizo & Prawns. season with salt & pepper & stir through, then leave, don’t worry if some of the rice sticks to the pan, the Spanish appreciate this ‘Socorrat’ as the best bit! 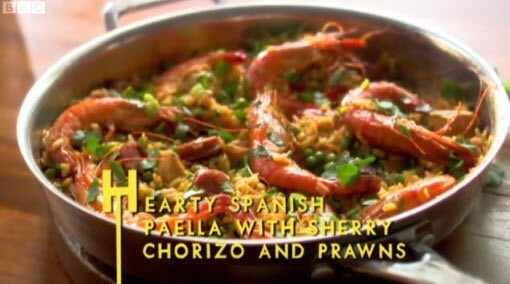 you don’t mention sherry in your list of ingredients for Heart Spanish Paella with Sherry! Ooops, amended now, it was in the method, thanks for pointing out my omission. Can you tell me how many the above recipe will feed ? Serves 4 or 2 if your hungry! increase quantities for larger portions. I did this dish last saturday, as there was 2 of us we halved the quantity, it was “just enough” although we felt we could have eaten a bit more, it was so tasty, Lorranines book says use a pinch of saffron which we bought but to be honest would have been ok without it, also as we dont like shelling prawns at the table we bought frozen raw uncooked tiger prawns (150g), again we had halved the quantities, if you are doing this to feed 4, do the amounts above and use approx 250-300g of prawns. We used smoked garlic which was perfect. Red wine goes so well too! For paella you really need to use a paella rice like arborio, basmati & other rice varieties really will not soak up the flavours quite the same and will not give the creamy finish, arborio rice is widely available from good food shops & your local supermarket and is not expensive, from experience half a packet will make a meal for four…. Oh and on the Sherry front, any will do… whatever you have lurking at the back of the drinks cabinet. OK to leave out the Chicken meat but I insist you add extra Yorkshire Chorizo! Just made this tonight – was gorgeous. Fed two of us. We would add more chorizo and prawns next time and would add more chicken as well if feeding more than 3 people. Where in the world has chorizo, garlic and paprika the paella ? (chorizo is basic paprika, garlik ang pork meat) And maybe i could agree with the sherry, but that wasn´t cherry (for the color px or oloroso) And the spring onions with the prawns, come on? And remove it? Please i d´ont say it isn ´t good to eat, but d´ont say that´s a paella. @ quique ameneiro ‘ Get a life, don’t criticise a beautiful dish. If you do not like it, then don’t make it. This is for people who appreciate good food, not for whingers like you!